The delicious rich scents of roasted coriander and cumin seeds filling the kitchen and the tiny satisfying “popping” sounds they make are some of the rewards of cooking authentic Thai Massaman Curry. 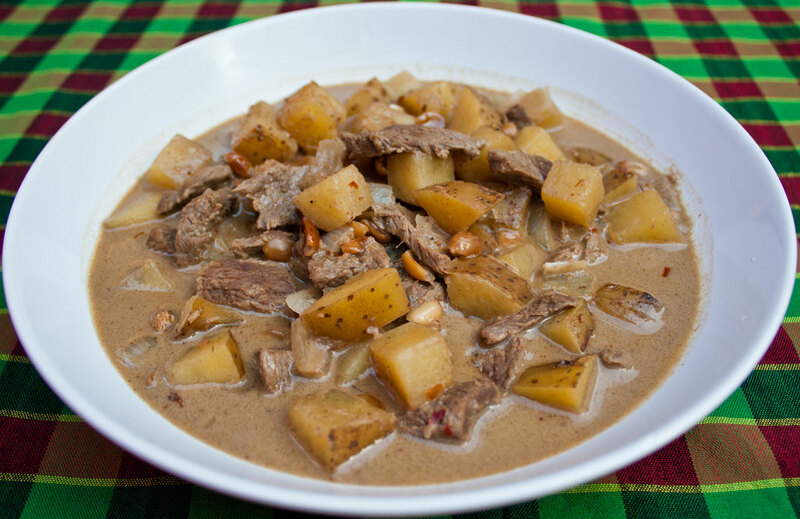 This is one of my favorite curries with tender slices of long-cooked beef with soft chunks of potatoes contrasted with boiled peanuts in a complexly spiced coconut sauce. 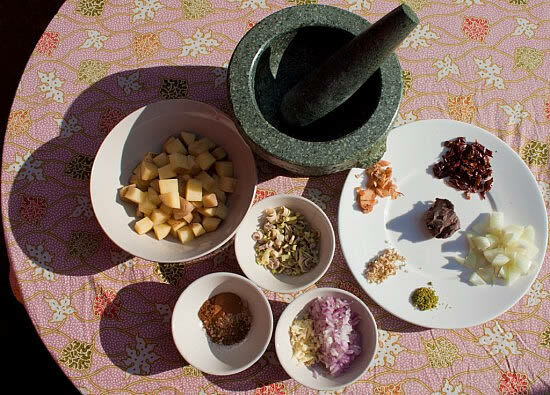 Massaman’s flavor owes more to dried spices like nutmeg, cinnamon, cloves, and dried chilies than to the more typical fresh Thai spices like lemongrass and kaffir lime leaves, making it unusual amongst Thai curries. The inclusion of these dried spices reveal the influence of Malay and Indian cooking on this curry, which originated in the South of Thailand. This “Muslim-style” curry can be made with mutton, chicken or beef but not usually with pork (although it can be). 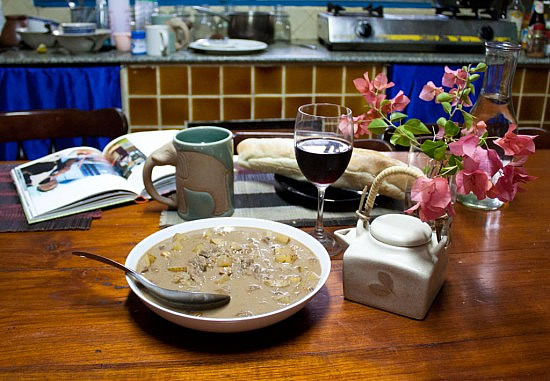 Massaman Curry is a great match for a crusty baguette, sauteed vegetables or a fresh salad, and an assertive red wine. 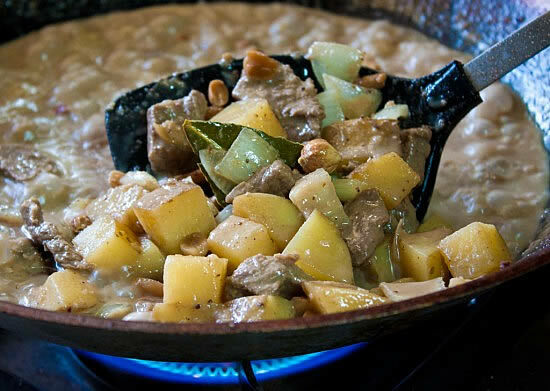 Since many of you live in places colder in early December than here in Chiang Mai, Thailand (where the “cold” season is a chilly 50°F at night at the most extreme) Massaman curry makes for a warm and hearty, winter meal. Thai people usually serve their curries over steamed jasmine rice, but Massaman curry is also a great match for a crusty baguette, sauteed vegetables or a fresh salad and an assertive red wine. With this recipe from Temple of Thai and with help from an expert curry-maker, I made a delicious, creamy, complex Beef Massaman Curry. Then set the curry paste aside. Skim the coconut cream from the top of the can, and put it aside. Thai beef usually comes from grass grazing cattle. This is an efficient and ecologically friendly way of producing beef. The meat is tougher and more strongly-flavored than beef in other countries, so it should be boiled longer – I kept the meat simmering for 40 minutes, but you might be able to reduce this time to just 5-10 minutes if you use a higher grade of beef. Adjust the cooking time for other types of meat. Use tofu for a vegetarian Massaman by adding unboiled tofu to the curry towards the end of cooking. and boil for 20 minutes. Drain the beef and reserve the stock. Until fragrant and steam rises from the paste. This cooks the shrimp paste so that it tastes mellower and less raw. Boil these ingredients together for ten minutes, adding the reserved broth if the coconut milk becomes too thick. This curry should have a lot of broth, like a soupy Green curry, not a thick sauce like a Penang or Indian-style curry. If you want a lower-fat recipe, add more broth and reduce the coconut milk, though this will taste less creamy and a bit more spicy – the coconut fat mitigates the heat in the curry paste. Temple of Thai’s Asian food store has everything you need to make this Massaman Curry, like coconut milk, dried spices, and tamarind. 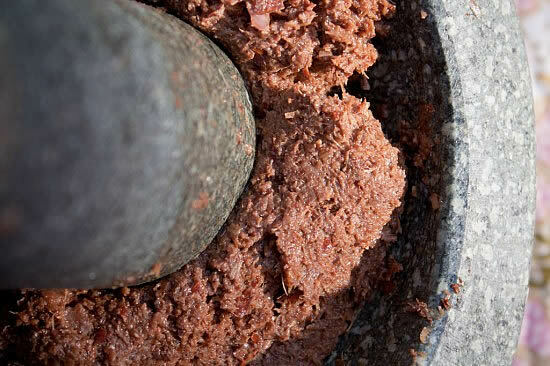 Or take a shortcut and try this curry paste to make a quick, authentic Massaman Curry.